First of all, I was given THREE blog awards by some sweet readers. 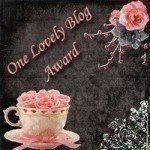 The ever faithful and encouraging YayaOrchid gave me the "Lovely Blog Award"
I am passing this on to Kim at The Way Life Should Be. One Sarah gave me the "Kreativ Blogger Award." I am passing this on to Mary at Scottish Folds Knits. 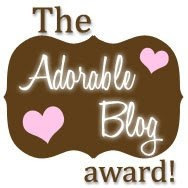 And one of my new favorite bloggers, Sarah gave me the "Adorable Blog Award." I pass this along to Diane at Sustained by His Grace. The Kreativ Blogger Award requires seven random things about myself. 1. I eat only one kind of salad dressing - Seven Seas Viva Italian - which unfortunately is discontinued. When my supply is up, I will be in Salad Deprivation. 2. I am a facebook stalker. Who isn't though? 3. The children's book I wrote has gotten one rejection letter (which is not a bad thing). 4 I won't eat bananas because of the texture. 5. When I was a baby, I had a pacifier called my "peep." I'm retired from being a school teacher. Yes, I quit my job. Now I'm a nanny for an adorable baby girl three days a week. Once I get in the swing of things, I'll be using the other two days to sew and craft so hopefully I will fill (and empty) my etsy store. Who knows? Maybe I'll Brett Favre it and unretire, but right now, I'm loving my new career! Thank you for the award, Keri! Do I do something with it on my blog? I've never gotten a blog award before.